However, according to another perspective, such as the one held by the founder of a political party Jamaat-e-Islami and numerous other conservative Islamic militant groups, Pakistan was meant to be an Islamic state alone with Shari’a embedded into its Constitution. “Islamization” in particular began when the 1973 Constitution came about during the time of Zulfikar Ali Bhutto, which based the entire Pakistani political system around Islam. It began with Bhutto’s attempts to receive financial aid from the Gulf States and further extended its roots when he gave the permission to classify Ahmedis as non-Muslim while supporting the formation of religious extremist groups. The roots further solidified when Zia-ul-Haq came into power and adopted the now obsolete Hudood Ordinance which completely changed the functioning of Pakistan. Under his governance, the Sunni sect in particular gained more power, paving way towards an extreme form of sectarianism, resulting in the Shi’a community being a major target. Subsequently, Musharraf’s decision to be an ally to the United States in the war against terrorism post 9/11 angered these radical religious groups which had nurtured within the country over decades, since Pakistan was deemed to be ‘aiding the enemy’. 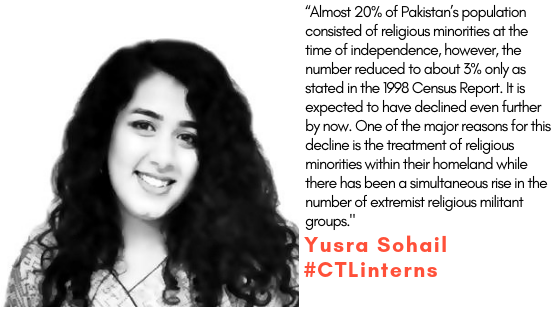 Almost 20% of Pakistan’s population consisted of religious minorities at the time of independence, however, the number reduced to about 3% only as stated in the 1998 Census Report. It is expected to have declined even further by now. One of the major reasons for this decline is the treatment of religious minorities within their homeland while there has been a simultaneous rise in the number of extremist religious militant groups. Minority communities faced extreme forms of discrimination and the blasphemy laws stated in section 298-B as well as 298-C of the Pakistan Penal Code which came about through the 1974 constitutional amendment made it easier for extremist groups in the Muslim majority to further carry out hate crimes while simultaneously getting away with them. These sections are often referred to as the anti-Ahmedi laws which prohibited them from associating with Islam, making practising or preaching Islam by them a crime and resulting in three years of imprisonment along with a fine. When efforts were made to amend these clauses, extremist groups caused an uproar making it almost impossible to do so. The stronghold of such extremist groups made it difficult for the law to award punishments on a fair basis and numerous innocent people had to face not only jail-time but also the death penalty in certain circumstances. Constitutionally, Pakistan endorses religious freedom as well as the freedom of speech. Practically, this freedom of speech is only limited to lengths where “the glory of Islam” remains unchallenged and is not defamed, under s.295(a), s.295(b) and s.295(c) of the Penal Code. Penalties range from receiving death in circumstances where Islam or any of its Prophets are defiled, to life imprisonment for defaming, defiling or desecrating the Quran, while demeaning “another’s religious sentiments” may result in 10 years of imprisonment. Blasphemy laws are extremely subjective since they can be interpreted in different forms and exploit loopholes for carrying out hate crimes. This has been proved evidentially because over time the same laws have been used by certain groups in the religious majority of the country to carry out their extremist activities, whereas marginalised groups have been getting crushed under discrimination, injustice and extreme forms of oppression. A recent development regarding this aspect is a High Court ruling which requires all citizens to state their religious affiliation before they enter into military, civil or judicial services. It also states that all citizens must declare their religion on their passports, identity cards, birth certificates as well as voter lists. This again indirectly acts as a means of carrying out religion-based discrimination while putting religious minorities under the direct eye of militant groups making it much easier to target them. Even though the blasphemy laws are laid down in a way where other religious communities can also bring claims when their religious beliefs are insulted, such claims are not taken seriously when brought forward by citizens that belong to another faith. It is mostly the cases brought forward by the Sunni Muslim majority that are given importance even though most of these cases have hidden agendas behind them such as the settling of personal grudges or simply taking advantage of the unequal power dynamics based on one’s faith. Cases such as that of Aasia Bibi, Mashal Khan and Salman Taseer are prime examples of how dangerous the current law is. Instead of curtailing religious hatred, it is only aiding extremists in their agendas while the minority communities are nearly getting wiped out, with numerous members either fleeing their homes or their country, going into hiding or living under constant fear. This conclusively brings us to question the state where religious sentiments reside at the bottom of our hearts, religious tolerance is close to being non-existent and sectarianism has prevailed deeply within our nation since decades. Should vague laws such as those pertaining to blasphemy exist specifically when the damage they have already caused and are continuing to do so has been so vast that it has resulted in Pakistan being labelled as one of the countries on the watch list of the US Commission on International Religious Freedom (USCIRF)? The grounds for being on this watch list include the tolerance of activities curtailing religious freedoms within the country. Unless key stakeholders realise the threat that Pakistan’s deep rooted sectarianism poses and unless they work together to bring it to an end, this country will be pushed deeper into a bottomless pit . The writer is a student of LLB, University of London, International Programme at SZABIST and an intern at Courting The Law. She has keen interest in the rights of women and marginalized communities.